Click to view brochure and learn more. 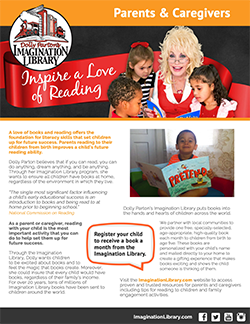 Dolly Parton’s Imagination Library is a book gifting program that mails free books to children from birth to age five in participating communities. Each month, the Imagination Library mails a high-quality, age-appropriate book to all registered children, addressed to them, at no cost to the child’s family. Countless parents have shared how excited their child is when their new book arrives each month. Many groups and individuals work hard behind the scenes to make that special moment possible for each child. What is Ready4K? Ready4K is a research-based text messaging program for parents provided at no cost. Each week, you will receive FUN FACTS and EASY TIPS to boost your child’s learning. Ready4K activities build on the things that you already do with your child – like getting ready for school, eating meals together, and going to the store – to make boosting your child’s learning fast, fun and easy. Math in the Mail is FREE to families who qualify, and focuses on developing math skills in three-year-olds by providing the tools needed for parents, guardians, and other caregivers. By increasing pre-school aged math skills and confidence, Math in the Mail will help children gain the math knowledge that will help them have more positive and meaningful science, technology, engineering and math (STEM) learning experiences in the future. Click here to view the brochure and learn how to sign up. Bedtime Math helps parents talk to kids about math in a fun and engaging way. We post zany daily math riddles for kids aged 3-9, with different levels of math. No logins. No drilling. No scores. Whether it’s flamingos, ninjas or pillow forts, kids can see the math in their favorite topics. It’s fun and it’s easy - even for parents who don’t like math themselves!